Kirk's Jerk Kitchen is a Jamaican, family owed business serving Caribbean cuisine. They were awarded a BOOST Grant of $749 to purchase two fryers for cooking meat and vegetables separate for dietary restriction accommodations of their customers. Amici Milledgeville is a pizza, wings & sandwich restaurant with a full bar. They have been part of the wonderful downtown Milledgeville scene since 1999. Their BOOST Grant award of $1000 will be used to repair and rehab their façade to improve the aesthetics for visiting customers. We received BOOST Grant funding of $1000 we used for much needed flooring. We installed a beautiful, durable floor that drastically enhanced the appearance of our shop, a factor in customers returning. Being a small business, the grant greatly helped us improve our hot dog shop, our business, to which we have dedicated many long hours and years. What impact do you feel the BOOST program has had on our community? The BOOST Grant provides more than funding. It provides support to small businesses and this community. Is there anything I haven’t asked you would like to mention? We appreciate the opportunity the BOOST Grant provided us to improve our building, inside and out. 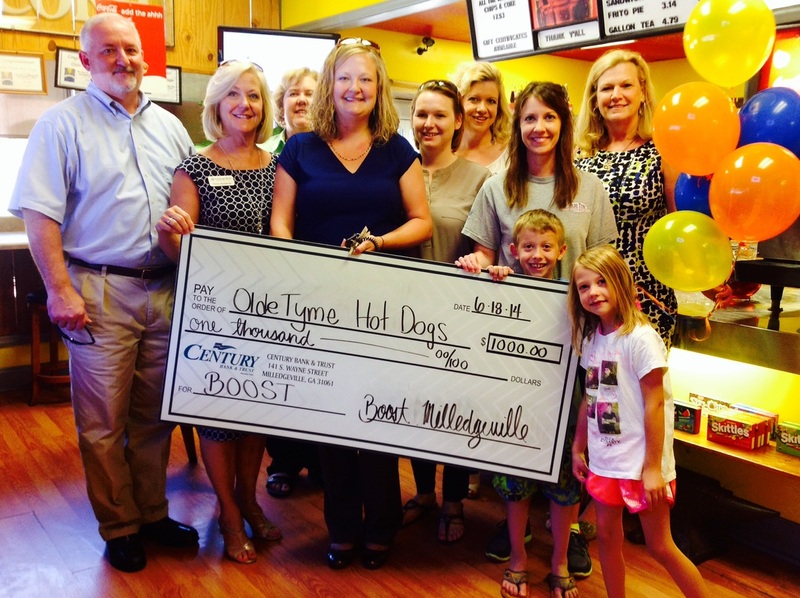 BOOST is an excellent way to encourage business growth in Milledgeville. Olde Tyme Dogs definitely benefitted! 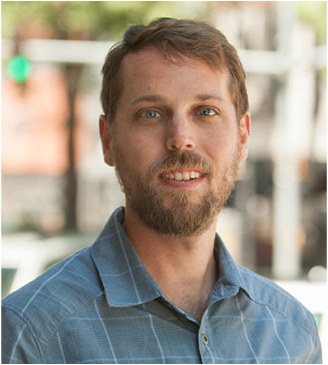 Adam Heagy is co-owner and General Manager of Oconee Outfitters, Milledgeville’s local source for quality bicycles and outdoor gear. Adam moved to Milledgeville in 2005, when his wife, Liz Havey, took a position with Georgia College & State University. An avid cyclist, paddler, and general outdoor enthusiast, Adam spends much of his time feeding his passion for active recreation with his wife and their dog, Alice. Adam was pleased to give us some of his in-demand time to talk about supporting the community as a BOOSTer. Why did you decide to become a BOOSTer? Supporting BOOST is important to me as both an individual seeking to support my community and as a business owner familiar with the challenges of running a successful small business. My business, Oconee Outfitters, was fortunate to be BOOSTed and receive the kind of support I want to, in turn, give to another local business owner who can benefit as well. 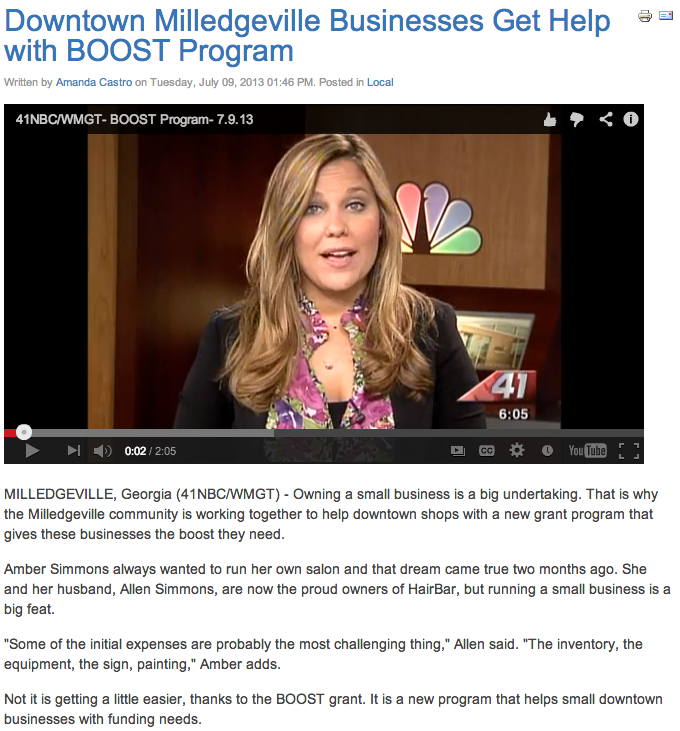 Why is the BOOST grant program important? The BOOST grant is an amazing way individuals can directly support their community in a very tangible way. BOOSTing one small business supports multiple local businesses because grant funds are typically spent by the BOOSTed business for local services and products. How does the BOOST benefit the community? 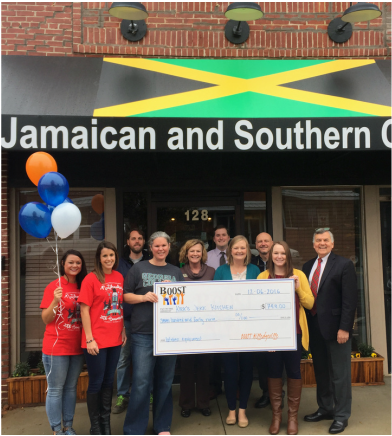 BOOST supports the success of community businesses which benefits this community as a whole. As a small business, receiving grant funding can be the extra "boost" needed to grow and improve services provided to customers, to elevate the overall customer experience that can translate into customer satisfaction and an increase of business patronage. 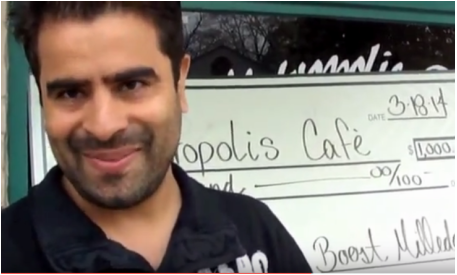 Since 2009, Deepak Kumar has built Metropolis Cafe into a successful business, with numerous loyal customers, offering a wide range of delicious Greek and Mediterranean staples, Indian cuisine, and catering services. Deepak has always been an enthusiastic supporter of the community with involvement in numerous organizations, a couple of which include Good Karma: Center for Yoga & the Healing Arts and Habitat for Humanity. For Kumar, his customers are a favorite thing about running his business. “Meeting people every day is one of my favorite things,” he said. “People always ask me why I don’t want to take hours off, but what am I going to do? Sit at home? This is my home. I meet people and talk to them, learn about their life, and maybe share mine. That’s what I like.” Since he is rarely not working at the restaurant, we took our interview to Metropolis where Deepak answered a few questions for us. How did the BOOST grant benefit Metropolis Cafe? We received a $1,000 BOOST grant award in 2014 making it possible for us to purchase new signage needed for a long time, since our opening in 2009. New signage made Metropolis Cafe more visible to downtown patrons and was a major component previously missing to our being able to effectively market our business. How does BOOST benefit the community? 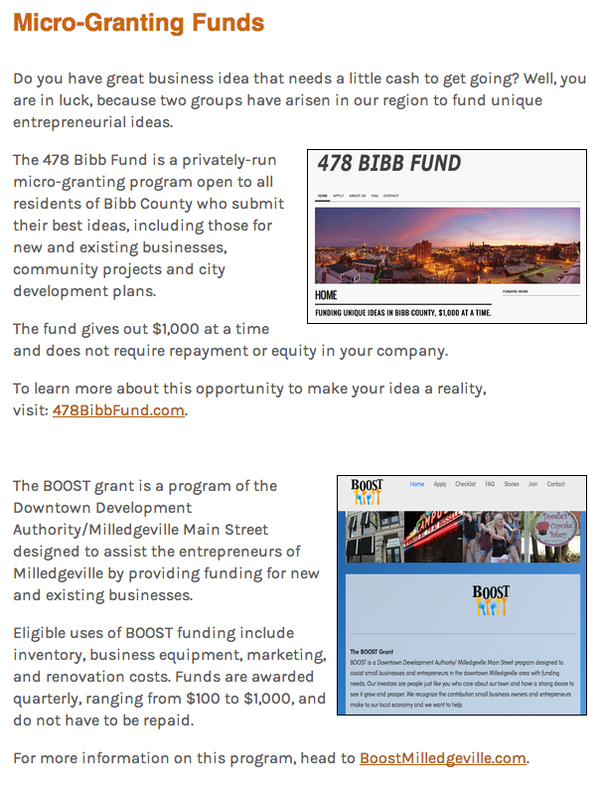 BOOST is an amazing program, a creative concept by Main Street/ DDA to pool the resources of funding from individuals and business owners to financially support local businesses and organizations. 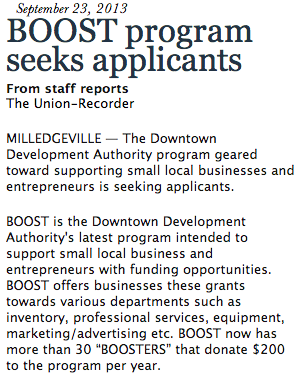 When we applied for the BOOST grant, it was during a slow time of the year for us and other downtown businesses. Receiving BOOST funds to cover 2/3 of the cost for new signage allowed us to make an investment, directly helping our business grow, when we otherwise would not have been able. Impeccably dressed, perpetual smile beaming, arms loaded with binders and a laptop, Angie Martin steps into another day. One of Milledgeville’s most vibrant ambassadors, the President and CEO of the Milledgeville-Baldwin County Chamber of Commerce has a daily agenda that would easily exhaust her industry peers. Martin took time out of her busy schedule to sit down and answer a few questions about the BOOST program and the Chamber's involvement as a BOOSTer of businesses. Angie Dalrymple Martin was born in Atlanta and moved to Milledgeville in 1989. She attended Georgia Southern University, where she earned her Bachelor of Arts in Communication Arts, minor in Music. Coming from a background of 10 years in on-site and executive multi-family property management throughout the Southeast, Angie joined the Milledgeville-Baldwin County Chamber of Commerce as President & CEO in March of 2015. Her love for people, appreciation of locally owned businesses and pride in Milledgeville were the driving forces for bringing her back home. She is a recent graduate of the Georgia Academy for Economic Development and was selected as one of 40 participants in Georgia Forward’s Young Gamechangers’ program. She serves as PC Advisor for the Kappa Upsilon Chapter of Zeta Tau Alpha, sits on the Boards for both the Milledgeville Rotary Club and Baldwin College & Career Academy. Angie is married to Philip Martin and they have two furry children, Coco Chanel and Suzi Q. Because it makes sense for the Chamber and it’s mission to “promote business development and community advancement”! For the Board of Directors who manage the financial investment of the Chamber, BOOST is a way to have direct, positive effect on the member businesses that we serve and represent. What impact do you feel the BOOST program has had on the community? 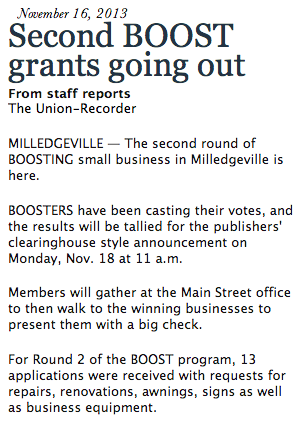 BOOST has had a HUGE positive impact at a very small investment for the BOOSTers. The saying "it takes a village to raise a child" can be said for a community supporting local businesses. Each BOOSTer's part is small, but collectively, has amazing potential for the greater collective, community good. What do you think of the program and its success? Individuals have approached me at conferences and training classes around the region that are familiar with the BOOST program and have implemented programs similar in their community. 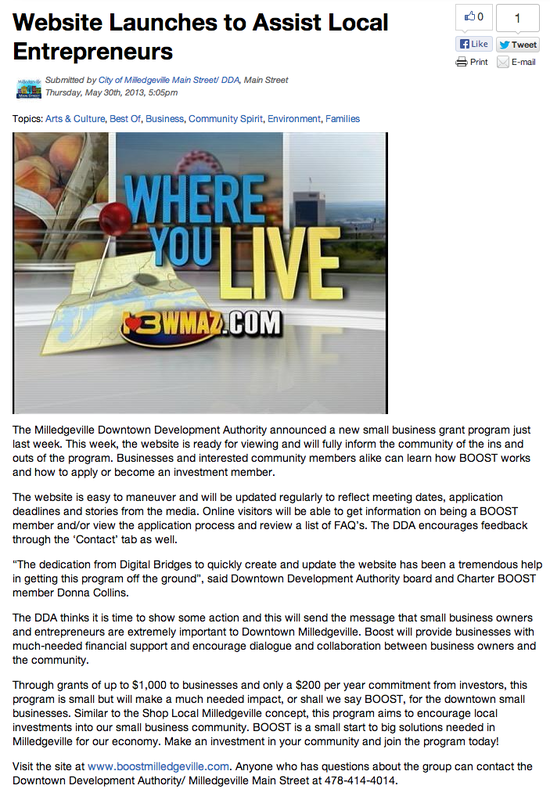 I believe imitation is the greatest form of flattery and the Milledgeville Main Street/ DDA Board of Directors, Executive Director Carlee Schulte, and staff should be very proud of the BOOST program and implications for their inspiring development state-wide. I'm proud to say our community supports the BOOST program, a simple, yet brilliant initiative. I’m thrilled that the Chamber is able to contribute on a small scale to a larger, collective effort toward supporting our local community and Milledgeville being a great place to live, work and play. 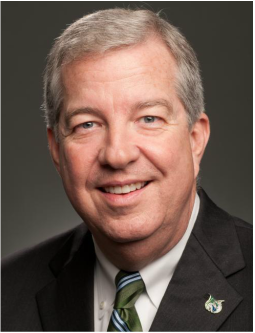 With the new school year fast approaching, Dr. Steve M. Dorman, President of Georgia College, answered some questions about himself, being a BOOSTer, and discussed the BOOST grant and its community impact. Dr. Dorman is the 11th president of Georgia College & State University and has laid out an ambitious direction for the college which includes emphasizing success of students, faculty and staff; increasing campus diversity; investing in campus technology; focusing on economic development for the region; and increasing the university endowment. Dr. Dorman and his wife, Jane, have three children: Steve Michael, Rachel and Timothy; daughter-in-law Julie; and one grandchild, Trip. Milledgeville is a great place to live, work, learn and play. While I am not a business person, I have great respect for those who take the risk to start a business or develop a new idea. 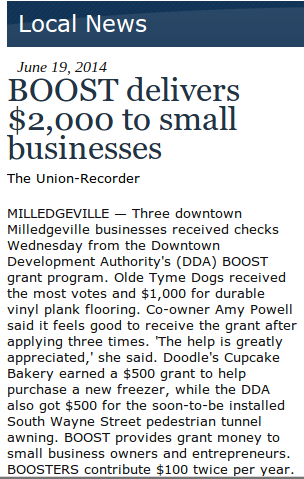 BOOST provides a way for me to play a role in encouraging the small business owner to take that risk and invest in Milledgeville. 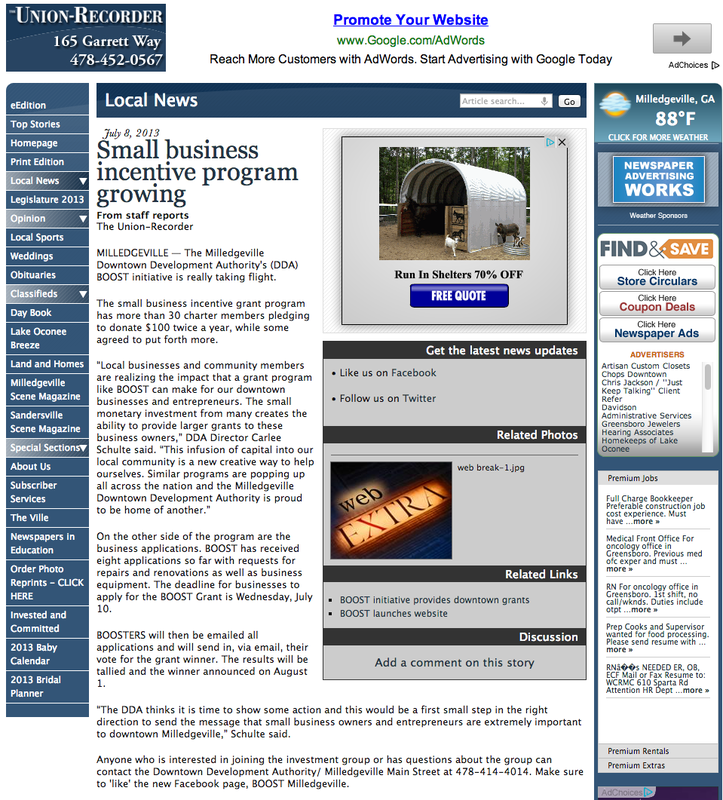 BOOST helps to encourage businesses to come, stay and grow in the downtown area. This makes the downtown area a vibrant place for our community and for university students. I hope it is encouraging to the downtown area business owners to know that individuals in the community value their work and are trying to find ways to help them continue and improve what they are doing for our community. Our university students want to go to school in an area that is vibrant and thriving. 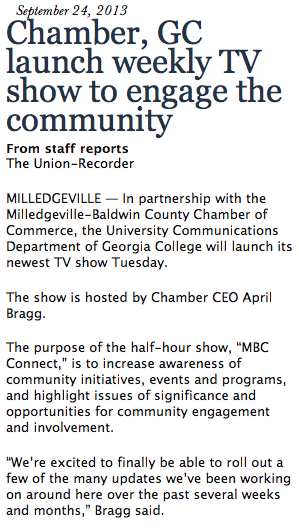 So it helps us as a university when Milledgeville is growing finding ways to meet their needs. What motivated you to become a BOOSTer? I like the idea of helping people and that has been the basis of my life long banking career. I felt like local community members joining together to “BOOST” others would be rewarding for me personally and also a great way to help and support other business owners. I am proud to be a founding member of BOOST and I encourage others to join in this very worthwhile program. I am very proud of the success and the impact we have had. It is amazing what small donations from a larger group can do for the local economy. As of the last round of grants we have donated over $18,000 to small business owners right here in Milledgeville and this has been accomplished in a fairly short period of time considering we first announced the program in May of 2013. Our business, The Market Collective has actually been a beneficiary of the BOOST grant. The funds we received enabled us to put up a very nice sign which hangs proudly outside our storefront. The vintage themed sign was designed by and purchased from a local sign company, J.L. Signs., so the grant we received actually helped BOOST two local businesses. We all enjoy and benefit from the businesses that are located in the heart of our historic downtown. It is what gives us a sense of belonging and a sense of place. I could not be more proud to play a small role in the continued success and growth of our town thorough the BOOST program. I hope others will consider joining this successful crowd funding program and watch our downtown continue to improve and thrive! Milledgeville Main Street/ DDA is a big fan of Farmer’s Markets, running the Milledgeville Farmers Market at the Pavilion on Tuesday's. We sat down with our fellow farm-fresh food advocate, Chelsea Losh of The Green Market, to get her thoughts their farmers market and the impact of the BOOST Grant program. Tell us a little about The Green Market. The Green Market is a local, sustainable, producer-only Farmers Market in Milledgeville, Georgia founded in 2012 by a group of hard-working farmers who live and farm in Milledgeville and the surrounding areas committed to bringing good, fresh, sustainably-grown food to the people of Central Georgia. The market is open on the 1st and 3rd Saturdays Year-Round, 9am-12pm, at The Pavilion in downtown Milledgeville, 222 E. Hancock St., next to The Golden Pantry. At the market, expect to find seasonal produce, grass-fed beef, chicken, and lamb, farm-raised eggs, handmade baked goods, artisan jams and jellies, and potted plants. 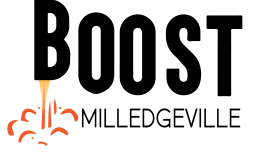 You can also find local community organizations at market: Live Healthy Baldwin, Keep Milledgeville-Baldwin Beautiful, and the Twin Lakes Library System. At every market, you can grab a cup of Blackbird Coffee at the market table, participate in a one-on-one yoga session with Good Karma Yoga, and drop your kids off at Kids Corner (bubbles! books! hula hoops!). We accept cash, check, credit, debit, and SNAP (and we DOUBLE food stamp dollars!) so you've got every reason to come and see us! Need a ride? We've got you covered! Hop on the FRESH FOOD BUS SHUTTLE (it's free!) to ride to and from market! What did the BOOST grant fund for your organization and what impact did it have? The BOOST Grant funded the purchase of Green Market promotional t-shirts from local business, The 42nd Floor. We've sold most of the t-shirts as a fundraiser for the market, but also given them away as prizes in our weekly raffle and as incentive for our market volunteers. Sales from the t-shirts are one of our biggest sources of donations and they have the added bonus of providing walking advertising for the market when folks wear them around town! The BOOST program has helped The Green Market get the word out about fresh, local food in our community! 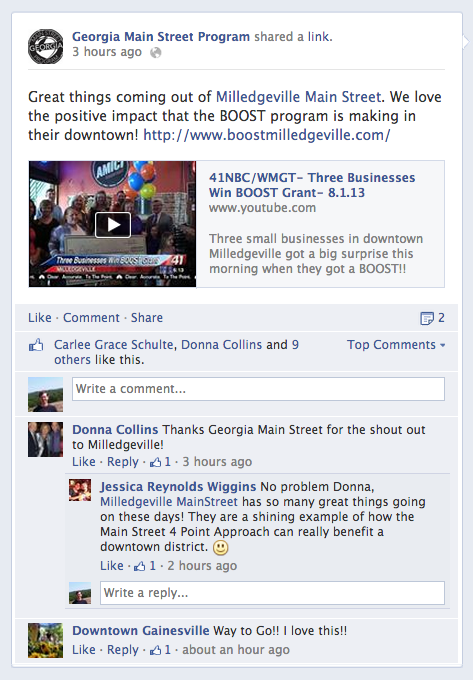 The BOOST program has given our market brand recognition and brought more folks to downtown Milledgeville on Saturday mornings. 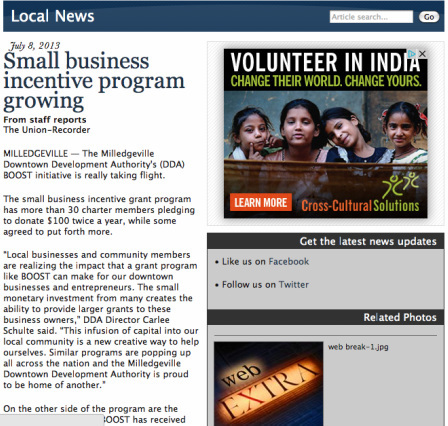 The program has helped small businesses in Milledgeville fund projects, attain more advertising, and build their brands! Plus, the BOOST funds we received were, in turn, spent on services from another local small business, BOOSTing them as well. We're excited to have a received a "boost" from the BOOST grant and think that this program is a great resource in our community. 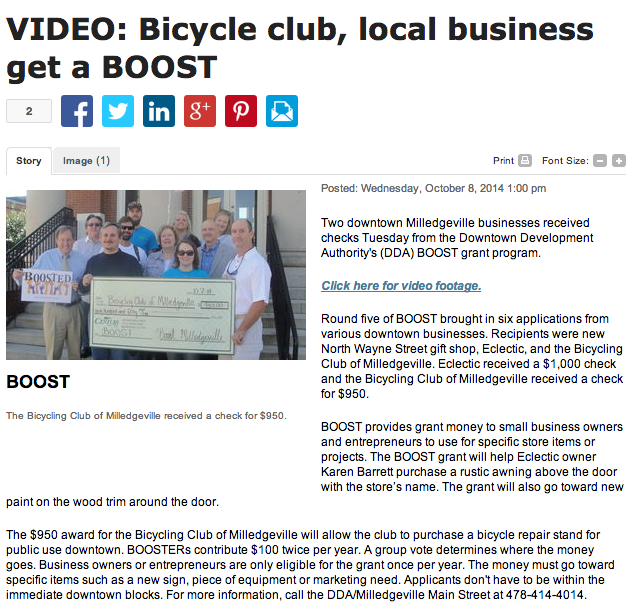 BOOSTers directly invests in and supports BOOSTed businesses and organizations like The Bicycling Club of Milledgeville (BCM), whose mission it is to make Milledgeville and Baldwin County a safer place for more people to ride bicycles more often. In October 2014, the BCM was awarded a BOOST grant in the amount of $950 used for the design and placement of a public-use bicycle repair station behind the Convention & Visitor’s Bureau building in downtown Milledgeville. 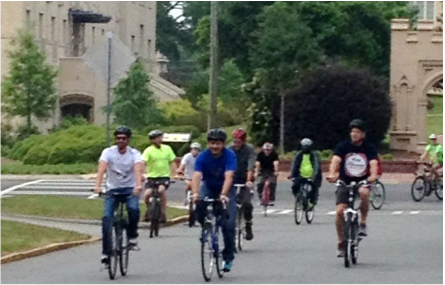 The BCM has recently partnered with the City of Milledgeville and Central Georgia Autism for the 4th Annual Red Clay Ramble, a bicycling race that explores a mix of red clay, gravel and paved roads of middle Georgia. This year’s race will be held on Saturday, August 20th at Checking Station Road in Eatonton. For more information or to register, visit the BCM website at www.milledgevillebikes.com or call Membership Director Tamara Siragusa at 478-451-9601. 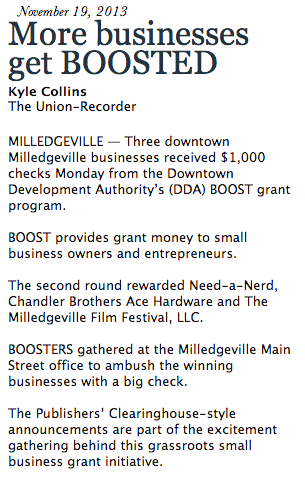 BOOST, created by Milledgeville Main Street / Downtown Development Authority, is a great program which has helped many local businesses succeed & grow when they otherwise may not have without support. Grant fund can be used for many different needs such as renovations, repairs, and new equipment for improved customer service. BOOST grants support the recipient businesses and other local businesses to whom they turn for goods & services. Local dollars get invested in our community and stay local. 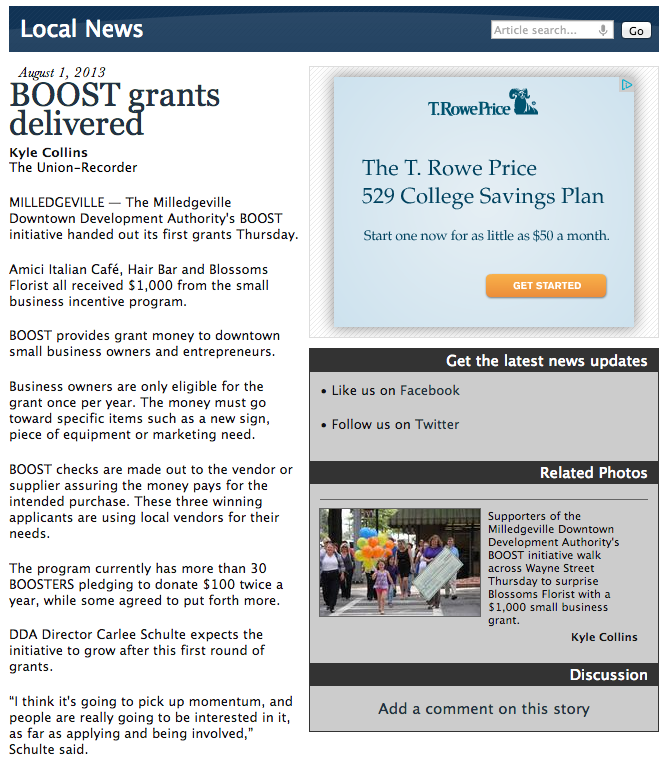 What did the BOOST grant help fund for your business & what was the impact? 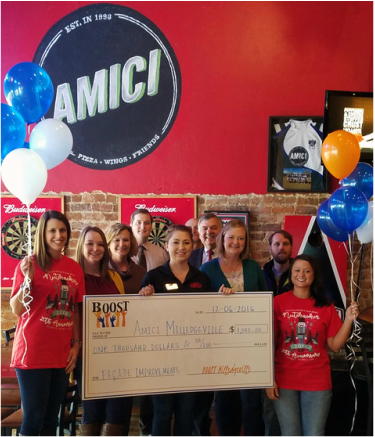 Amici Milledgeville was honored to receive the first ever, "You've been BOOSTed" check in 2013. We knew exactly how to use that money to improve our location. We made much needed repairs to fix a leak in the roof. With the funding opportunity of being BOOSTed, not only were we helped to make the repairs, but we helped by employing a local company to make the repairs. What are your thoughts on the program's success? 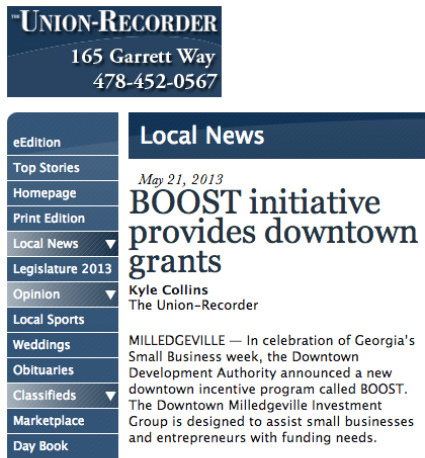 The outcomes of the BOOST program can be seen all over our great city & downtown Milledgeville. From new awnings to new signage, the financial support the BOOST grant provides helps keep our community thriving and continuing to attract new visitors who put money into the local economy. BOOST is a huge success in our book!